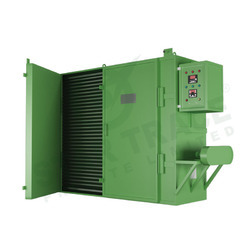 The Industrial Tray Dryers are small industrial systems which are highly demanded in the all industries. These dryers are equipped with air heaters and a fan that enables passage of air over the product being dried. Our this range of products is specially featured with latest and compact design which is very user friendly. Once installed, these run flawlessly for a long period of time. Our research and development team is constantly doing research to innovate new techniques and path making solutions to offer latest industrial tray dryers to our customers. 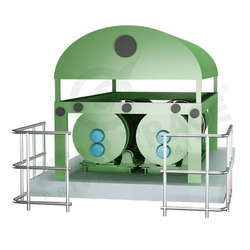 We hold an expertise hand in designing and fabricating tray dryer. Manufactured under the team of experts, these dryers are highly appreciated by the pharmaceuticals, foods, chemicals and other Industries. construction lined internally with 18 SWG and externally 18 SWG MS sheet. The cavity formed in between double wall will be properly insulated with 60 mm thick glass wool to prevent heat losses from dryer. Doors: Heavy duty airtight hinged doors made from 16 SWG MS sheet backed by 50 mm glass wool on the inner side and ball catch locking arrangement together with 40 mm asbestos gasket rope ensure very sturdy construction of the dryer. Air Circulation: Air inside the dryer is circulated by one heavy duty axial flow S.S.304 or aluminium blower fitted on a shaft of and driven by l H.P. through belt. The special design of the Blower ensures uniform air circulation so that there is uniform air current over the entire charge loaded in the trolley inside the dryer. The working of the motor is indicated by lamps in the control panel. Trays: Trays will be manufactured from 1.6 mm SS 304 sheets. Its dimensions are 32" x 16" x 1 l/4". The Trays have rounded corners with' mirror finish from inside and outside. SS 316 quality is available on demand. Racks and Trolleys: Racks are provided for trays inside the dryer. They are of fixed type for 12 and 24 trays models for 48 and 96 trays models. Racks are provided with wheels to slide them in and out of the dryer. An additional S.S, trolley for Racks for outside movement can be provided on request. Control Panel: Pre wired control panel will be consisting of digital temp. Indicator, connector for motor, over current relay, fuses, Indicating lamp, push buttons, main isolator switch etc. Painting: The dryer will be spray painted with two coats of high temperature resistance Aluminium paint and the outside cabinet have one coat of Red oxide backed by hammer tone finished paint. After filtering and heating, the air enters into air distributor on top of the Spray Dryer. The hot air enters into the drying room in spiral form and uniformly. By passing through high-speed centrifugal atomizer on top of tower, the material liquid will rotate and be sprayed into the extremely fine mist liquid beads. Through the very short time of contacting with heating air, the material can be dried into final products. The final products will be discharged continuously from the bottom of drying tower and from cyclone separator. The waste gas will be discharged from exhaust fan. Rotary Dryers is a kind of highly efficient, stable and reliable heating drying equipment (dryer), it is designed by Star Trace to dry materials of high moisture or strong stickiness. 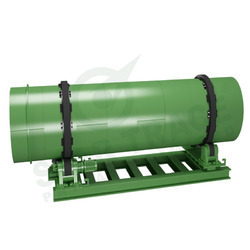 Rotary dryer has a better performance than tube bundle rotary dryer, blade rotary dryer. Rotary dryer has the features of big capacity, low energy cost and high efficiency. 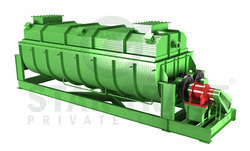 Rotary Dryer is widely used for drying slag limestone, coal powder, slag, clay, etc. Rotary Dryer can also be used in building materials, metallurgy, chemical and cement industry. Rotary Dryer mainly consists of dryer body, raw material feeding plate, driving and supporting device, seal ring, etc. Rotary Dryer can be generally divided into four types, they are: rotary dryer, triple-drum dryer, indirect heat transfer dryer, vertical dryer. Different kind of dryer has its own characters and advantages, the specific choice of a special dryer depends on different elements. The customer can consult Star Trace to select the most suitable dryer. Double Drum Dryer is widely used in drying granule material in fixed moisture range, all kinds of molding sand in casting industry and blast furnace slag in building/cement industry. Small size clay, small granule material in chemical industry which can't happen chemical effect, high temperature resistance and not have strict control to smoke. According to different moisture requirement for dried material in various industry, finished products water content be able to below 1-0.5%. Triple-drum rotary dryer use telescope-feed structure, dry the material quickly. Simple design, self-insulation, improve the heat efficiency to exceed 80%. Good drying performance, coal consumption<8KG for dry 1 ton material. The fuel can be coal, oil, nature gas etc. Dry mass, granule and power material. Reduce land area for 50% compared to single drum rotary dryer, so construction investment can save 50%. Power construction saved 60%. Finished product moisture can be adjusted depends on requirement of client. Lower outlet temperature, longer dust removal using life. Drive by tug not gear and pinion. Finished product temperature lower than 60°c, packing can be done continuously. Drum Dryer is a kind of highly efficient, stable and reliable heating drying equipment (dryer), it is designed by Star Trace to dry materials of high moisture or strong stickiness. Rotary dryer has a better performance than tube bundle rotary dryer, blade rotary dryer. Rotary dryer has the features of big capacity, low energy cost and high efficiency. 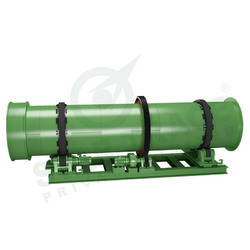 Drum Dryer is widely used for drying slag limestone, coal powder, slag, clay, etc. Dryer can also be used in building materials, metallurgy, chemical and cement industry. Dryer mainly consists of dryer body, raw material feeding plate, driving and supporting device, seal ring, etc. Dryer can be generally divided into four types, they are: rotary dryer, triple-drum dryer, indirect heat transfer dryer, vertical dryer. Chemical dryer is a kind of highly efficient, stable and reliable heating drying equipment (dryer), it is designed by Star Trace to dry materials of high moisture or strong stickiness. Rotary dryer has a better performance than tube bundle rotary dryer, blade rotary dryer. Rotary dryer has the features of big capacity, low energy cost and high efficiency. Chemical dryer is widely used for drying slag limestone, coal powder, slag, clay, etc. Chemical Dryer can also be used in building materials, metallurgy, chemical and cement industry. Chemical Dryer mainly consists of dryer body, raw material feeding plate, driving and supporting device, seal ring, etc. Chemical Dryer can be generally divided into four types, they are: rotary dryer, triple-drum dryer, indirect heat transfer dryer, vertical dryer. Introduction: The Paddle Dryer is from the renowned company Star Trace which is one of the leading and reputed manufacturing company in India with 25 years experienced in this field. 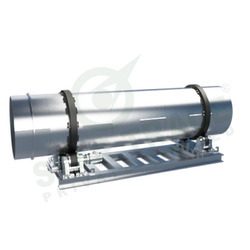 Star Trace Paddle Dryer designed and manufactured can efficiently dry all kinds of sludge by utilizing steam or heat conduction oil as heat source. The paddle dryer for drying or cooling of paste, particle, powder and slurry state of material, perform the process of drying, cooling, heating, sterilizing, reacting and combustion under low temperature. The special stirring and heating transferring blade, makes high heat transferring efficiency, and provide self-cleaning function. The special chock shaped stirring and heat transferring blade has high heating efficiency and self-cleaning function of the heating transferring surface. Hollow chock shaped blades are concentrated on the hollow shaft. Heat media flow through the blade from the hollow shaft. The heat transferring area in the effective volume is very high. The temperature range of heating media is -40 °C to 320 °C . It might be steam, or liquid state, such as steam, thermal oil etc. Indirect heating, there's no heat carried out by air. All heat is utilized for to drying the material except the lost of heat insulation layers. The surface of chock shaped blade has self-cleaning function. The relative movements of the product particles and the chocked shaped surface might clean the material attached to the chock shaped surface, so to keep the cleanliness of heat transferring surface during working. The shell of hollow blade dryer is Ω shape. 2 or 4 pieces of hollow stirring shaft are usually equipped in the shell. To avoid any leakage of material, there're sealed terminal cover and top cover with the shell. The heat transferring media flow through the rotation connector, jacket's shell and hollow stirring shaft. To ensure best transferring effect, the hollow stirring shaft adopts different interior structure in accordance with different heating media. Steady operation: The material particles fully contact heat transferring surface, because of the special compressing and swell-stirring effect of the chock shaped blade. The difference of the temperature, humidity and mixing effect are very small in the different axial area, so to ensure the stability of process. The blade dryer is successfully applied in foodstuff, chemical, petrochemical, dyestuff, and industrial mud etc. 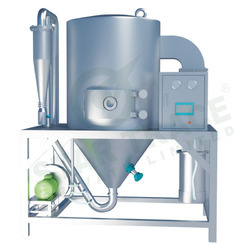 The heating transferring, cooling and stirring characters enable it to perform the following unit operation: combustion (low temperature), cooling, drying (recovery of solvent), heating (melting), reacting and sterilizing. The stirring blade is heat transferring surface too, so to increase heat transferring area of unit effective volume is increased, and decrease processing time. The chock shaped heat transferring surface has self-cleaning function. Compressing and swell-stirring functions make the material mixed uniformly. The material performs the movement of "piston flow" along the shaft. The difference of the temperature, humidity and mixing effect are very small in the different axial area. The blade dryer is capable to perform combustion under low temperature if we adopt thermal oil as heating media.